Burials in this cemetery were relocated to Oakwood Cemetery or the new Town Burying Ground located on the south side of Oakwood Cemetery. When the Rochester, Lockport and Niagara Falls Railroad Co. wished to change the line of their road from Main street in this village, it became necessary to run their road through the town bgurying ground, which was situated on Ontario Street, between Third street and the Canal Basin. Satisfactory arrangements were made between the R.R. Co. and the town, and a portion of the town grounds were deeded to said R.R. Co., who paid the town $200 for the right of way, and agreed to remove all bodies that had beed buried on the line of their proposed road, at their own expense, but under the directions of the town authorities. 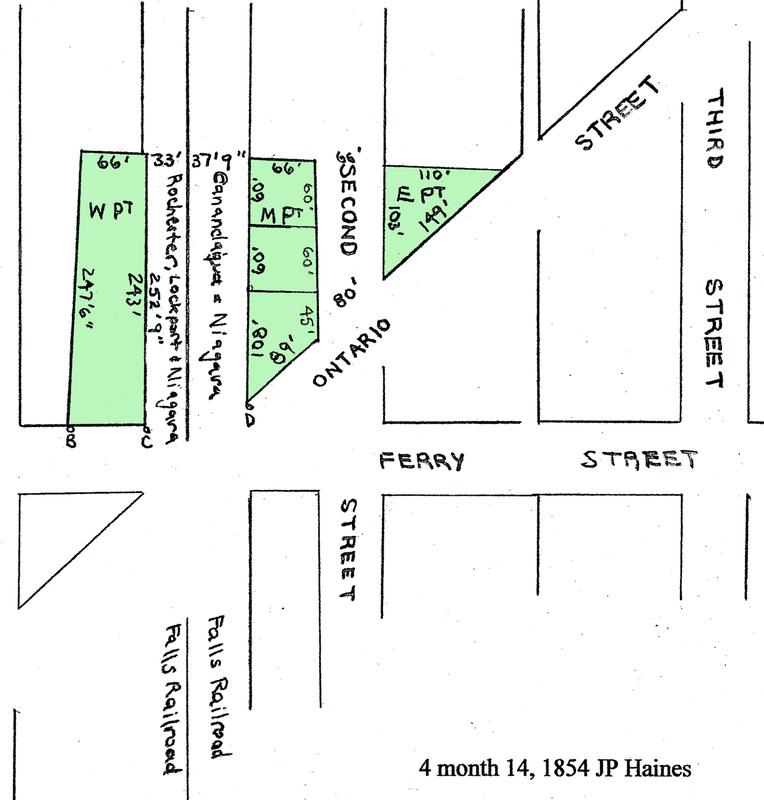 The stipulated price was paid, and from it was purchased by the town a new Cemetery Grounds of two or more acres next adjoining on the South of the Oakwood Cemetery Association, and the bodies that had been buried on the line of the proposed Rail Road were all removed, and buried either in Oakwood Cemetery or in the new town grounds. THe following year the Canandaigua & Niagara Falls R.R. Co. wished to pass their road through the old burying grounds, adjoining on the east of the road already located across the grounds. The town made satisfactory arrangements with the later R.R. Co., who were to pay the town $200 for right of way and to remove all remaining bodies in the entire grounds at their expense under the direction of the town authorities; this was done satisfactory to the town, the money paid, and the bodies buried either in the town burying grounds or Oakwood Cemetery, as friends desired, the former being free and the later by purchase of lots. 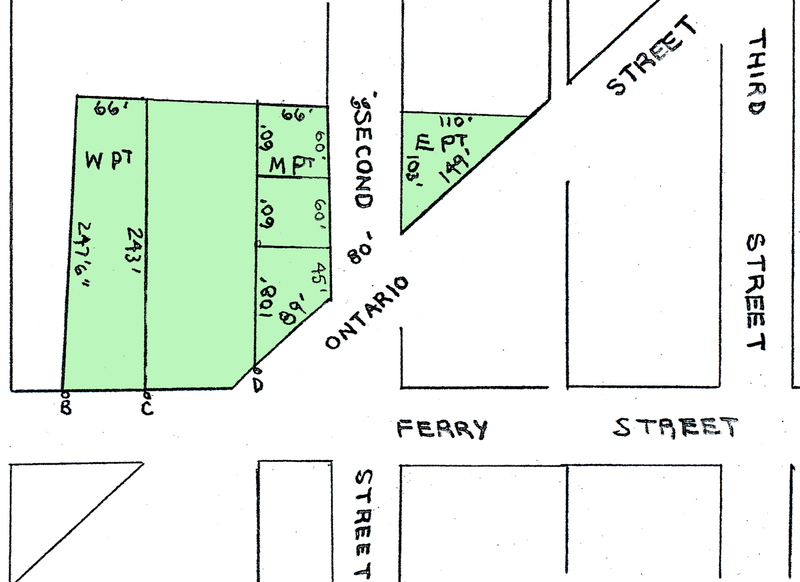 The funds derived from the last Railroad purchase were expended by the town in purchase of one or more acres of land for a town burying ground near "Young's Corners" and the election of buildings on the town grounds on the Portage road. "Proceedings of the Annual Town Meeting of the town of Niagara, held the 11th day of April, 1871." ...The Oakwood Cemetery is to go into possession of the land and appurtenances belonging to said town known as the Town Burying Ground, situated on the Portage road in said town; and said Oakwood Cemetery Association is to take care of said burying ground, and keep the fences and buildings thereon in good repair, and allow any person dying in the said town, to be buried therein without any fee or reward, except for digging graves; and any person wishing to dig a grave himself, shall have the privilege of doing so, without any charge. ... Given under our hands this 16th day of December A.D. 1873.